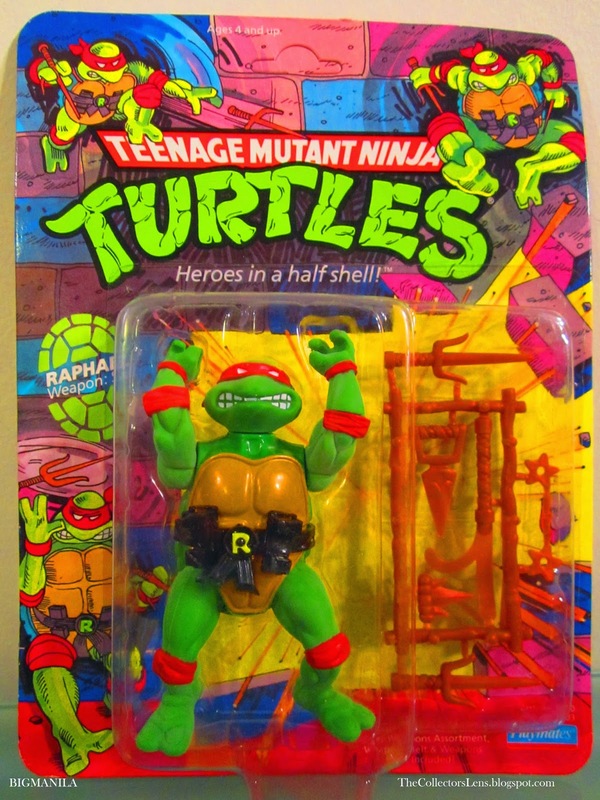 Raphael is the first Ninja Turtle I ever had. My brother got it as a gift from one of his friends for Christmas when we were in elementary school, after we got one we started to get more for our collection. I think watching the commercials really got me hook on the TMNT figures. Then the cartoon came. Opposed to being angry and sullen as in other versions, since the series is based on humour. Raphael is a sarcastic wise-guy, and supplies comic relief alongside Michelangelo, whose humour is usually attributed to his ignorance and spaciness. As a result, Michelangelo is the subject of Raphael's jokes more than any other Turtle. He frequently makes jokes that break the fourth wall. Raphael is the wittiest Turtle you're likely to stumble over. If things aren't going his way, his tongue snaps out sarcastic jokes dipped in poison. Even though he's referred to as the snapping ninja, the Turtles know he means well. Raph's clever skill with the deadly Sai allows him to strike at a distance and really keep the Foot in stitches. His way with a manhole cover has made him famous in sewers everywhere. Raph uses the 100 pound discs to flatten the Foot and to shield off Anti-Turtle blasts. Hot-head and sharp sai expert! Sai were small (10-24 inch) dagger-shaped truncheons that have 2 short prongs and on long on in the middle. They possibly derived from a pitchfork head, though farmers did use them to measure how far into the ground their seeds needed to be planted. Traditional sai are made of steel, or cheaper iron, and have no blades, yet are sometimes sharpened on the end to use for stabbing, despite being a blunt striking implement. The Shuriken was not originally designed as a killing weapon. It was mostly used to distract or deter so the ninja could escape. While in the midst of a get-away, the Shuriken could be thrown at the samurai chasing the ninja, possibly making the samurai think twice about continuing the chase. The original toy line was perfect! It's always weird going back and rewatching the original TMNT series because I recognize Raphael's voice (voiced by Rob Paulsen) as the voice of Mighty Max. It's weird because Mighty Max seems to have almost the exact same personality of Raphael, as they both constantly make wise cracks.